Almost 200 men identified by police as Bangladeshi have been found crammed into a shophouse in Indonesia, authorities said yesterday. Police in the city of Medan on Sumatra island were tipped off to the group by suspicious residents who lived nearby. When police raided the shophouse on Tuesday they found some 192 men, mostly in their twenties, occupying the two-storey building with many complaining about lack of food, authorities said. 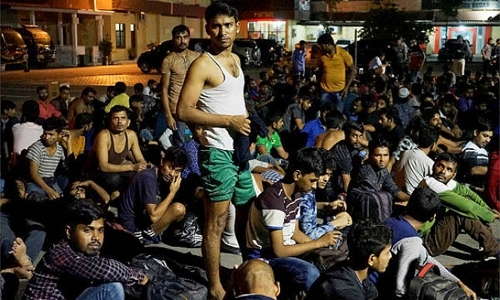 Officials said they believed the men had arrived from Bangladesh and were living in the cramped quarters for several months in the hopes of going to neighbouring Malaysia for work. “We think they arrived here by boat. They don’t have any documents,” said head of Medan immigration Fery Monang Sihite. “We’re still questioning them and will later decide whether we need to deport them or not.” It was not immediately clear who owned the building or what role they may have played in the affair. In recent years, Indonesia has seen hundreds of asylum seekers -- mostly Afghans and minority Rohingya from Myanmar -- arrive in the northern part of Sumatra. In 2015, hundreds of Muslim Rohingya arrived ashore in Aceh, where they were welcomed in the staunchly conservative Islamic province. Indonesia has not ratified the UN convention on refugees and asylum seekers are usually not allowed to work in the country.